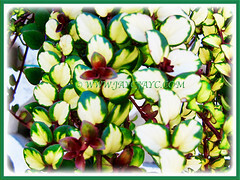 This Goldfish Plant is an elegant trailing plant with beautiful variegated foliage. It is covered with captivating goldfish-like flowers. Simply exotic and offering colours all year long. 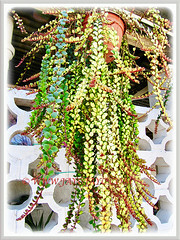 Wonderful if added to one’s garden with its attractive cascading branches of goodies! Botanical Name: Columnea scandens L. variegata. 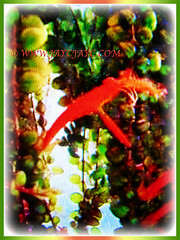 Common Names: Goldfish Plant, Flying Goldfish Plant, Columnea. Etymology: The genus Columnea was named in honour of the 16th-century Italian botanist Fabio Colonna. The specific epithet scandens is derived from the Latin word scandere meaning climbing or twining. Origin: Native to tropical Central and South America, and the Caribbean. It is popularly cultivated worldwide. 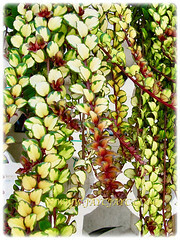 Features: Columnea scandens L. variegata is from the genus, Columnea that consists of about 200 species of flowering plants. 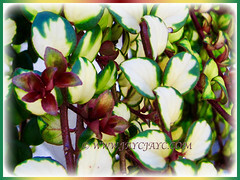 ‘Variegata’ is a cultivar with attractive variegated foliage. It has long and slender pendulous branches with opposite pairs of slightly hairy and variegated leaves, coloured green and yellow, sometimes changing to various shades of brown. The simple leaves are roundish to oval-shaped. Long stems can reach up to 1 m.
The tubular or oddly shaped flowers are usually large and brightly coloured in red, yellow or orange and resembling the shape of a gold fish. 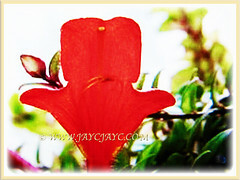 The showy and gorgeous flowers are orange-red in colour with yellow throats and appear at every leaf joint. 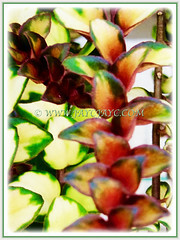 Culture (Care): Columnea scandens L. variegata or Flying Goldfish Plant can be easily grown with some extra care. Light: Bright filtered sunlight or semi-shade to full shade. Direct sun will scorch the leaves. Moisture: Moderate water requirements. Allow the soil to dry out slightly between waterings. It likes good air circulation and a humid environment. Others: Pinch off the stem tips regularly to encourage branching. This will prevent the plant from being leggy. Feed once fortnightly with a liquid fertilizer with lots of phosphorus at half-strength to encourage blooming. If the plant is in a hanging basket, mist the leaves often to keep it happy. It likes to be slightly pot bound and will produce better flowers if kept in this condition. For subtropical and temperate regions: Hardiness: USDA Zone 11 to 12. Columnea scandens L. variegata is intolerant of frost. It is also sensitive to high temperatures, requiring a steady temperature and sheltered from cold drafts. Provide the plant with a constant and fairly high humidity. If you see browning of the leaves or leaf drop, the plant is probably too hot and needs to be moved to a cooler location. Best to grow it indoors as a beautiful houseplant or in the greenhouse. Water freely, avoid wetting the leaves and keep the soil moist in summer. During winter, let the soil dry out more between waterings and this regime will help the plant to bloom better in summer. Do not feed during winter. 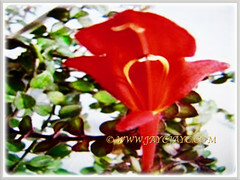 A seasonal bloomer that flowers profusely during spring and summer. Propagation: Easily propagated from stem tip cuttings that are without the flowers. 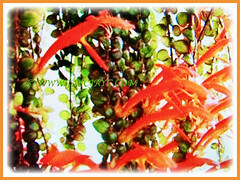 Usage: Columnea scandens L. variegata or Flying Goldfish Plant will be excellent in a hanging basket to effectively display their exotic flowers. 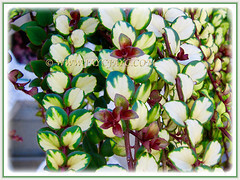 Ideal as a houseplant when placed on a pedestal table to show off its spectacular variegated foliage and blooms. Suitable for container gardening or grown in the ground. A wonderful ornamental perennial when trained over a pergola to display its cascading beauty.